There are times when you need to have power right at your fingertips – especially in this day and age where devices are extremely power hungry due to the numerous functions and features that they have. Well, you might be able to solve such worries with the $39.95 Brunton Torpedo 2800 Hybrid Mobile Battery & Charger, where this device functions as an all-in-one compact mobile battery and charger. To make sure that it plays nice with just about any gadget, it will come with the ability to juice up all devices that charge using a standard USB connection. 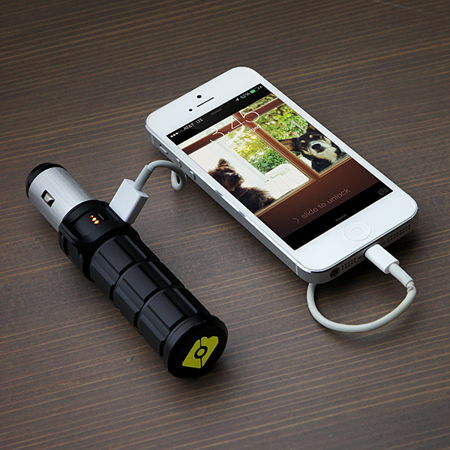 Inside, you will find a 2,800 mAh rechargeable lithium-ion battery. This hybrid mobile battery and charger all-in-one will be able to plug into your vehicle’s cigarette lighter socket, as it goes about recharging any device which juices up via standard USB. In fact, it is able to charge up any two devices simultaneously, since it comes with a couple of output sockets. We like the fact that it can be plugged into your vehicle’s power socket, giving you the option to juice up your gizmos before you arrive at your destination. Neat!